"Steve hiking with his son Chris on Mt. 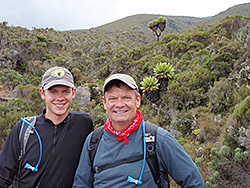 Kilimanjaro"
Steve Roberts is a lifelong Georgia resident, having grown up in Decatur, Georgia, where he still lives. Steve attended Decatur City Schools where he played football and baseball, and served as Student Body President. Steve is married and has one grown child. Steve graduated from Georgia State University with a Bachelor of Arts degree in history. While attending law school, Steve worked at the Court of Appeals of Georgia. After finishing law school, he began his practice in Decatur with Rich, Bass, Kidd & Witcher, while also serving as a part-time Magistrate Court Judge in DeKalb County. Steve has many interests. He is an avid reader and world traveler and adventurist. Steve has traveled to Africa, where he scaled Mt. Kilimanjaro, Africa’s highest peak at 19,350 feet. He has sky dived and paraglided in New Zealand, hiked and biked in Costa Rica, and spent time in South America, visiting Machu Picchu in Peru and snorkled in The Galapagos Islands. Steve has also hiked and kayaked in Iceland and explored volcanoes and caves. Steve has been actively involved in community work as well, serving a term on the School Board for the City Schools of Decatur, worked with youth as a baseball coach, coaching his son for several years in Little League and Pony League. For ten years, Steve served as the volunteer Mock Trial Coach for the Decatur High School Mock Trial Team. He also served the City of Decatur as a member of the Zoning Board of Appeals for three years. Steve has also participated in the People to People Program, touring Latin America and Cuba as a goodwill ambassador through the program created by the Eisenhower family for peace through understanding. A member of PAGE (The Professional Association of Georgia Educators) as a lawyer volunteer, Steve represents professional educators, mostly high school teachers, at Professional Standards Hearings and in court if necessary. In addition to teachers, Steve represents many junior high and high school students at disciplinary hearings before school tribunals and in Juvenile Courts all over the State of Georgia. For several years, Steve served on the Board of Directors of the Georgia Center for Children, an organization that provides free counseling to children who have been abused, and are in need of long term counseling.